I can’t recall the last time I walked out of Kinnick Stadium as angry as I was last Saturday. Other than blocking, catching, tackling, catching punts, kicking punts or covering wide receivers, I guess a few Hawkeye players did things right against Purdue. To find out for sure, I’d have to re-watch that fiasco of failed football, however, and that ain’t happening. In retrospect, I shouldn’t have been surprised. After all, it’s a Kirk Ferentz-coached Iowa season, which means any unexpected positive result must be balanced out by at least one head-scratching, ridiculous loss. Last year we got the thrill of beating Michigan after being uncompetitive against Penn State and losing to an FCS school. This year we got six glorious days to bask in a historic beat down of long-time nemesis Ohio State, only to be greeted with two weeks in a row of absolutely atrocious, uncompetitive football. It’s one thing to be uncompetitive against the undefeated Wisconsin Badgers, who have had Iowa’s number for some time now. But it is beyond inexcusable to get punked by a 4-win Purdue team at home, on senior day, even if they are better than past Boilermaker squads. A rare decent run against Purdue. Photo courtesy Hawkeye Report. You knew it was going to be one of “those games” as soon as Iowa’s special teams unit idiotically roughed the Purdue punter after the defense forced a three-and-out, leading directly to Purdue’s first touchdown. The Boilers would briefly relinquish that lead, but the pattern was set. A bevy of boneheaded Hawkeye miscues later sent Hawkeye fans fleeing for the Kinnick exits early. I suppose one silver lining is Iowa players have continued to play hard and show heart. That they do so while piling one mistake upon another, continuing to make basic errors like misidentifying who to block or who to cover and whether or not to catch a punt is, well . . . I guess it’s better than being stupid AND not trying. So they’ve got that going for them, anyway. As for the future of the Ferentz coaching regime – and by regime I mean the presumed fait accompli of a smooth transition from father to son at some point in the near-to-mid-future – I’m not sure that the 2017 November meltdown might not actually be a good thing. Bear with me for a minute, here. Let’s say Iowa had managed a very manageable comeback over mediocre Purdue. And then went on to smack around a demoralized Nebraska team in Lincoln. 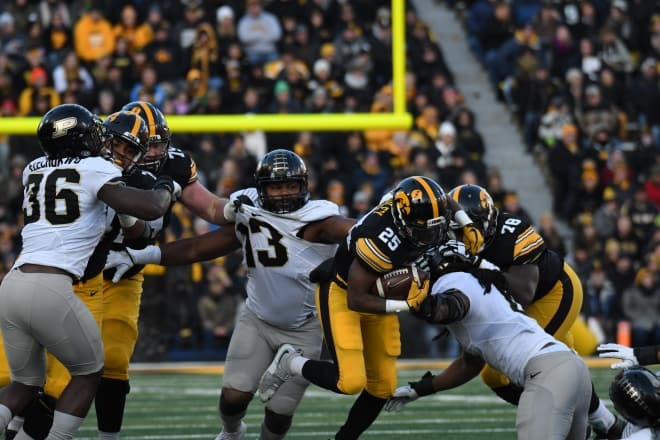 The Hawkeyes would be sitting at 8-4 and heading to a nice bowl, making the abject failure to move the ball in Madison little more than a nasty memory. Instead, a second week of abject failure should force this staff to take a long, hard look at the current direction of the program, particularly its moribund and molasses-like offense. Counting recent bowl losses, Iowa will now have lost five or more games in seven of its last eight seasons. In addition, it’s likely that six of those eight seasons will see Iowa finish at fourth or lower in a seven team division. Now, Iowa has finished over .500, gone to quite a few bowls and notched some huge wins over that period as well. And no one can diminish the achievement of finishing a regular season undefeated like the Hawks did in 2015. But being “pretty good” is not good enough. I’ve never been and never will be a “look at the size of the paycheck” guy. The elder Ferentz has earned his contract through uncanny timing of stellar seasons. But being slightly worse than Bo Pelini certainly doesn’t inspire the confidence to say one family should rule Iowa football in perpetuity. This is why I actually think this meltdown might be a good thing. It damn well better light a fire under everyone in the football facility hoping to keep that much-lauded “Iowa coaching continuity” thing going. Because right now the natives are restless and angry. Those are at least active emotions. The next step is apathy, which leads to empty seats, which leads to dwindling coffers, which apparently is the only thing that gets Gary Barta’s attention. Iowa fans aren’t particularly fickle. And they will forgive this no-good November if their beloved Hawkeyes legitimately compete for a West Division title in 2018.